Over the weekend I participated in the Source-a-thon at Wikitree. I was thinking it would be great if Geni had something similar, because I much prefer using Geni, and adding sources at Geni is much easier, at least for me. So, I decided to work on my own improving Geni profiles with sources this week. The first thing I did was work on my backlogged requests. Now I have 20 backlogged requests left. I went next to my Merge Issues. The default is Relatives. I have 35 unresolved Merge Issues. 1 is a Tree Conflict and 34 are Data Conflicts. I have 588 Matches. Of those 11 are Tree Matches and 19 are Record Matches. There are 570 SmartMatches (TM). First I checked out the 11 Tree Matches. The first 2 I looked at were correct matches, and I completed the merge. A 3rd match was also correct and quick to merge. This left 8 Tree Matches that I could not resolve at this time. I moved onto the 19 Record Matches. 19 isn't very many Record Matches really. I really hate creating source citations, so the way I can attach the Record Matches really appeals to me. The first Record Match was for Jane Felix. She had 2 Record Matches, one for the 1930 US Census and one for the Connecticut Death Index. I was able to add a death date and place for her. I added this data to my Ancestry.com tree as well, and was able to attach the 1930 and 1940 census to her profile at Ancestry.com. I was also able to add the US Social Security death index at Ancestry.com, which I could also add at Geni as it appeared in the Record Matches when I added the death info. Ancestry also had the US Social Security Applicaton and Claims file for her. 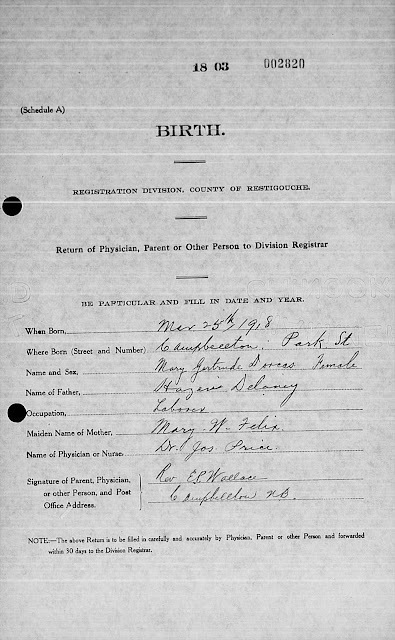 Ancestry also had a Drouin Collection entry for her birth. Ancestry also had her in the 1921 Canadian Census. Even more interesting, Ancestry had a first marriage for Jane to a Joseph Hazen Delaney in 1917! Ancestry offers up 4 more hints, in addition to the 9 I have already added. 1 of course is the Member Tree hints, and one is an image someone has attached that isn't something I want to add, and the other 2 do not appear to be her. So, I search Ancestry. This gives me 603,829 hits. I often wish there was a way to reject hits, because really, who can ever get to all of them without being able to remove some from the list. 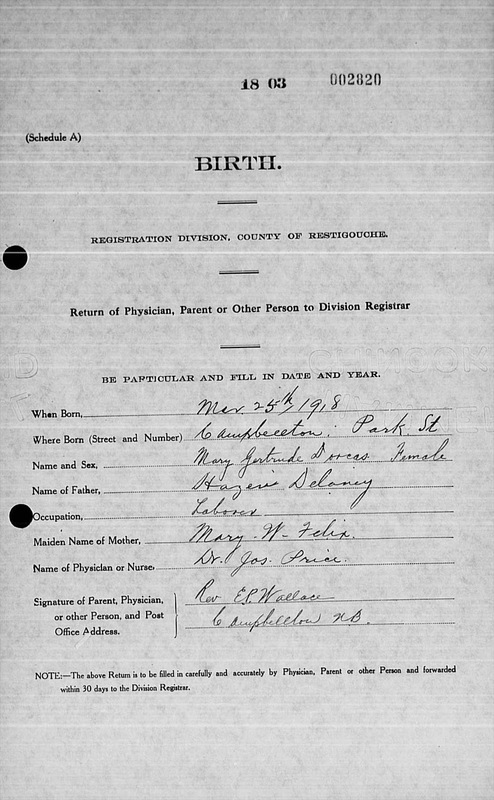 The top hit is for a Connecticut Naturalization Record, but has Jennie born in CT. Since it doesn't make sense a lady born in CT would have a naturalization record, I check it out and hit pay dirt! The actual record does not say she was born in CT, but Campbellton, NB, Canada. She petitioned to be naturalized in 1940. She states she has 8 children (I had only 7 in my Legacy file and at Geni, and even less on Ancestry.com. She claims her first child is Gertrude, born 25 Mar 1918 and residing in Campbellton. Since she married Mr. Delaney in 1917, it would make sense that Gertrude was from this first marriage. Sure enough, I was able to find a marriage for Gertrude, listing her parents, in 1933 when she was 15, marrying a Mr. Boudreau. With the extra info I was able to find her birth record as well. 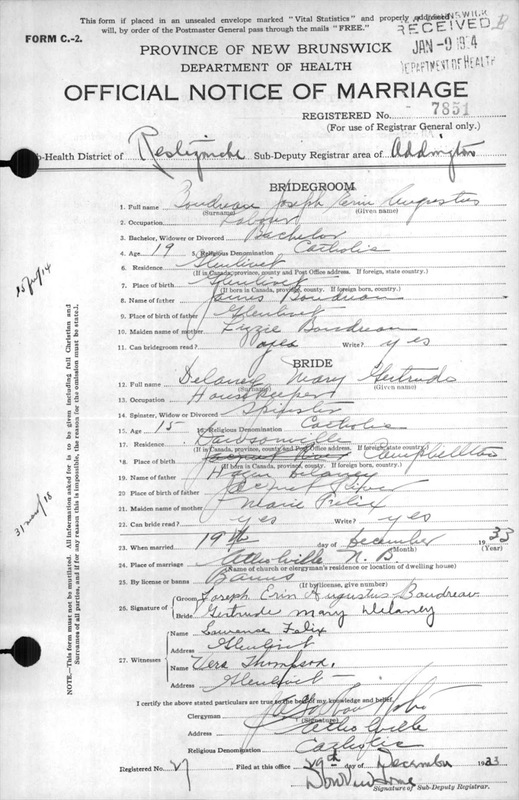 Gertrude was not living with Jennie and her husband in the 1921 Census. Apparently, she was living with her maternal grandparents, Thomas and Mary Felix in the 1921 census. I spent over an hour improving the various profiles for people in Geni and Ancestry.com. The second hint was for Alma Lillian Bowman. Attached and moving on. The next hint is for Richard Powell. All 5 hints were for a Richard born in England, when mine is listed as born in Canada. The next hint is for Ann Frances Adams. The hint provided was not for her, but I attached an obit for her and her sister. Next up was a hint for Benjamin Stewart. It was his birth record, I attached and moved on. Next was William P Creighton, 2 hints, both were correct. Then Peter Allan Felix, both were correct. I continued in this fashion until there were only 7 Record Matches left. Next up was profiles I Curate. 47 Tree matches and 151 Record Matches. Record matches on profiles I Curate are a bit tricky because if I am not a manager I can't add the sources directly through the Record Matches. On the other hand, many MPs are MPs because they are notable people which means there is a likelihood of many newspaper stories about them.